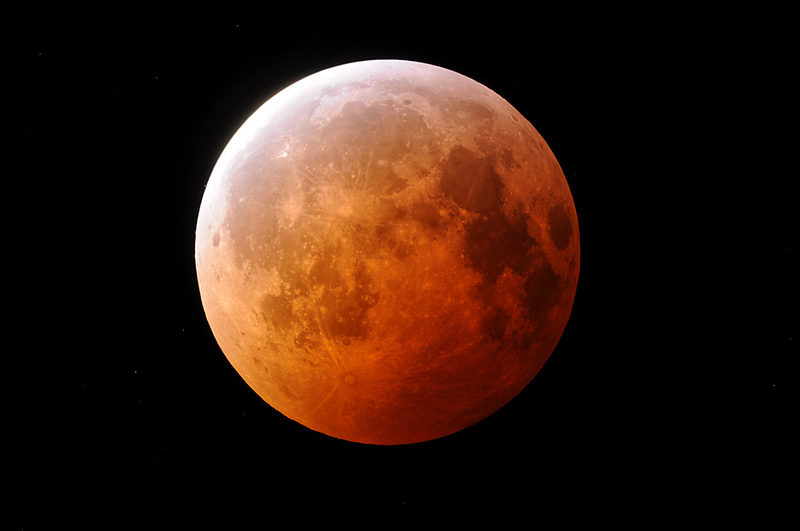 A List of Total Lunar Eclipses that I've seen. 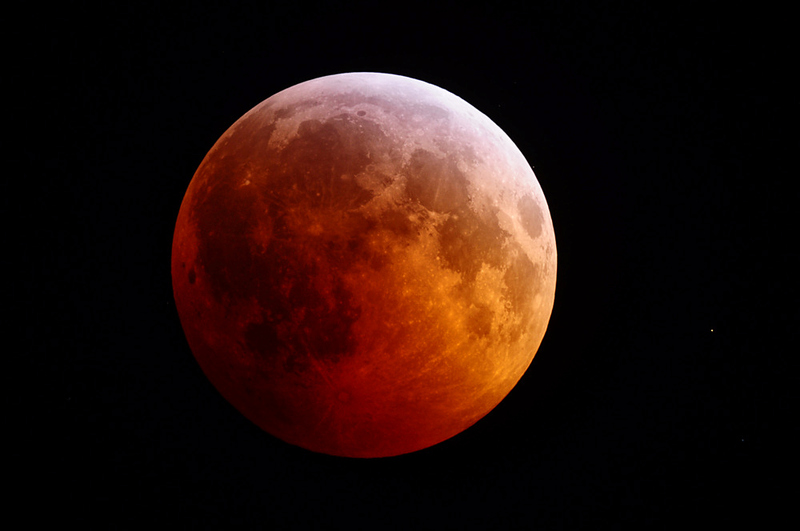 My first eclipse was the lunar eclipse of December 30, 1982. I observed nearly the entire eclipse from indoors. 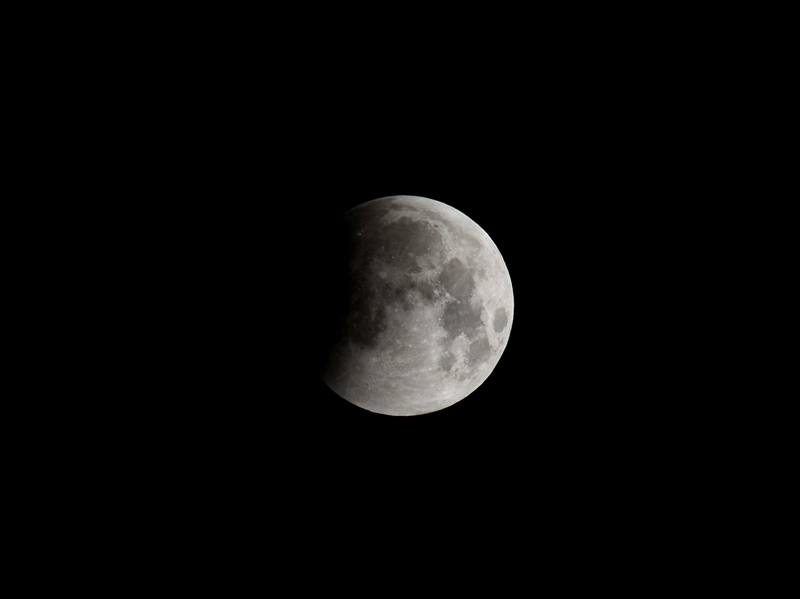 It was also a very early morning eclipse which meant that not a lot of people that I knew saw it. 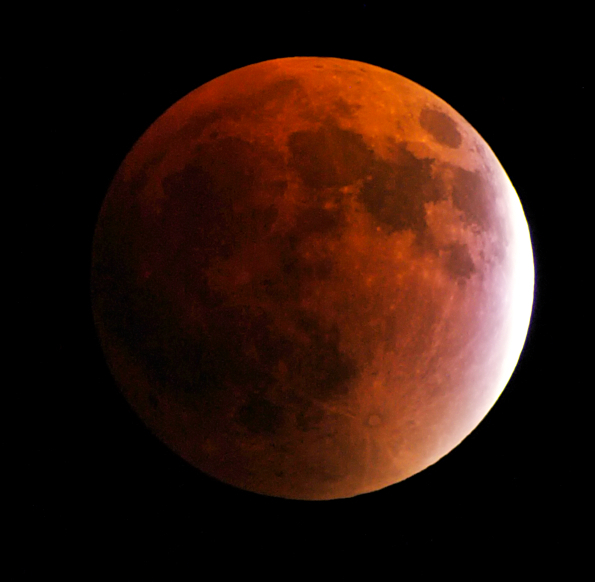 I enjoyed viewing it with my mother and father who were early risers. This eclipse was very dark. I lost sight of the moon during totality. Had I gone outside or had more observing experience I might have been able to see it. 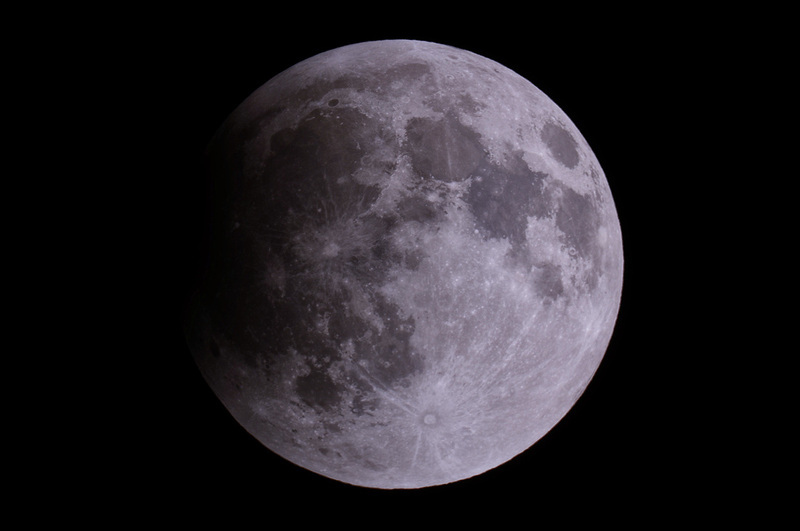 I don't remember a lot about what the moon looked like during this eclipse because I hosted a star party and was very busy answering questions and "repointing" telescopes. More than 70 people were in my backyard to view the eclipse through my 6" f/8 Criterion Telescope and binoculars. I did not take any photographs of this eclipse. Weather was good for this eclipse and I managed to get some shots of it using an old Albinar 70-300mm lens and my Nikon FG camera. By today's standards the images don't measure up but at the time I was very pleased. This was a fairly dark eclipse if I remember correctly. 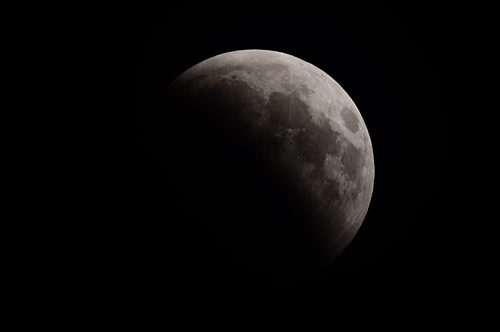 I video taped this eclipse on a cold winter's evening and the weather was very clear. I hope to post some frame grabs of this event later. I realized after this event that video was not the way to record this type of event. 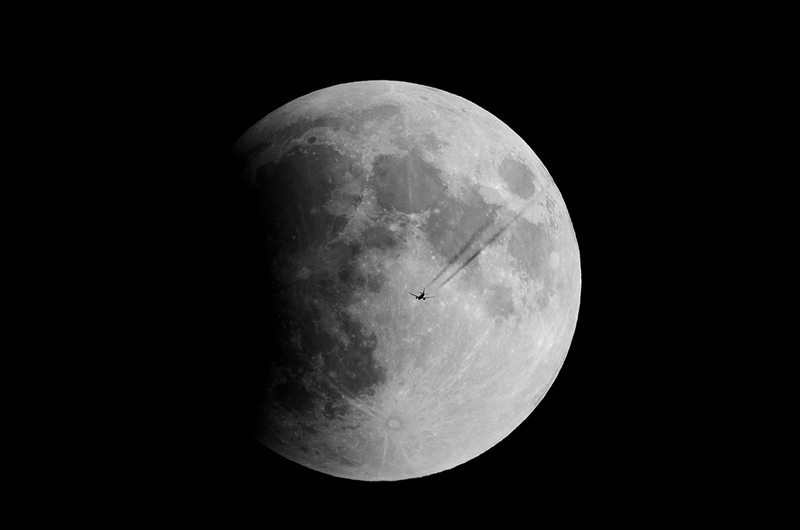 This eclipse was well placed and timed in the evening sky. The only bad thing was the cloudiness which interfered with any picture taking of the totality phase. Below is my best attempt at the totality phase. 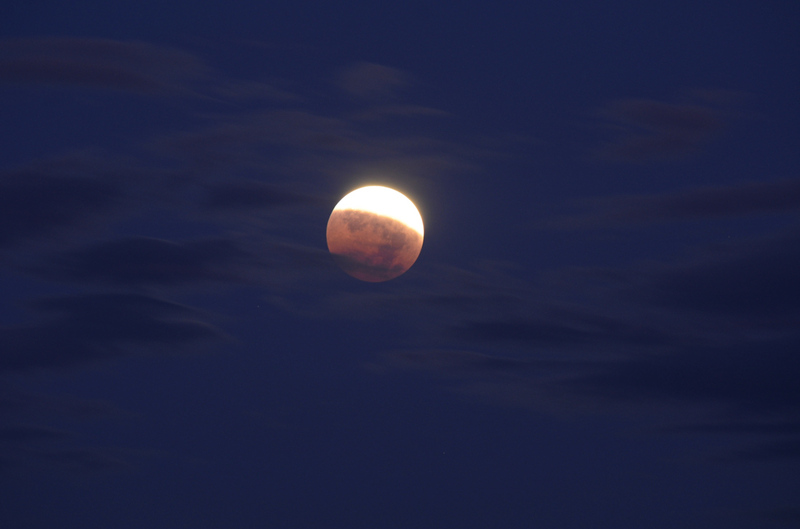 This eclipse was well placed in the evening sky but once again the clouds caused some troubles. This eclipse occurred early on a hazy and warm morning in August. Unfortunately the haze caused some problems with the photographs. The moon all but disappeared into thicker haze long before it set below the horizon. 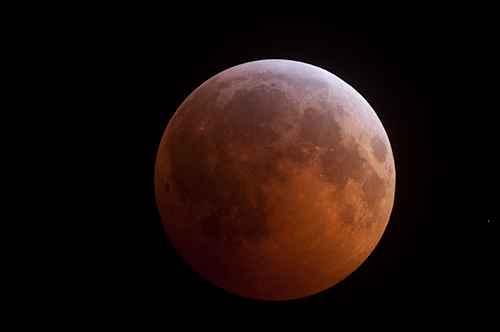 I think that if I had a choice I would rather that lunar eclipses occur during the winter months than in the summer due to photographic considerations. The air is just more transparent during the fall and winter months. 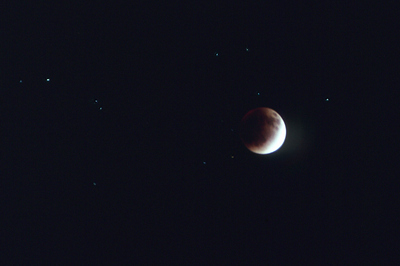 The eclipse of 2008 will stand out in my mind as being the coldest eclipse so far. 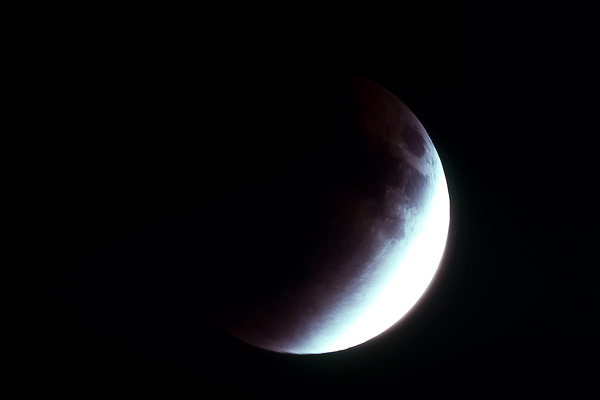 My first eclipse in 1982 may have been just as cold but I observed it from indoors. By the time that I was done and the high clouds were starting to move in the temperature had dropped to about zero degrees fahrenheit. My equipment was not working well and neither was my body by the time it was over. It became very tough to perform even the easiest of tasks such as switching camera lenses or to rotate the focuser on one of the telescopes. I felt like a climber on Mount Everest struggling to move about. It was worth it, however. As the eclipse progressed my visual surroundings went through an interesting transformation. The surrounding countryside was bright when the eclipse began with the moon shining brightly on the white snow-covered landscape. At totality my surroundings were very dark which made it seem that much colder. Where I was once able to read text and see my observatory surroundings without any trouble I was now in darkness and feeling very isolated. There were no sounds to speak of except for the interruption of a passing car every now and then or the occasional bark of a dog. This was an eclipse for all the senses that is for sure. 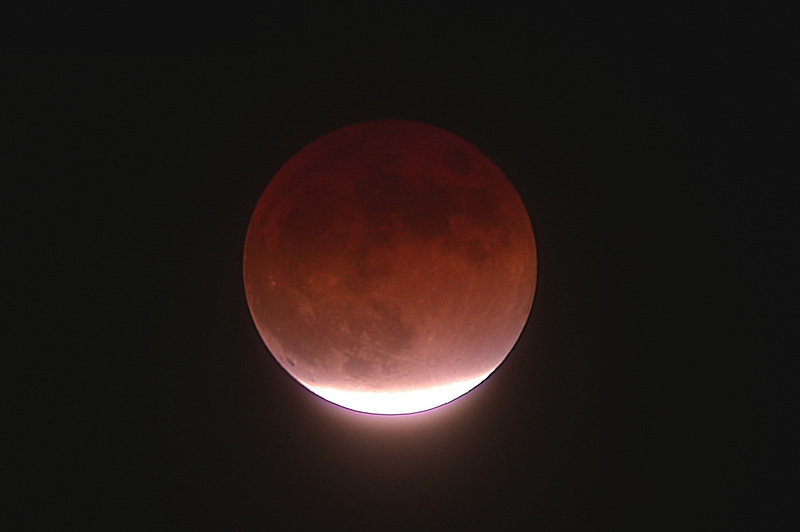 Unlike the previous August eclipse, this one was well placed in the eastern sky to view from my observatory. I used an 8" f/6 reflector and a 6" f/8 refractor telescope to take pictures and a tiny 70mm f/7 refractor to view it visually. The view with the naked eye was great. 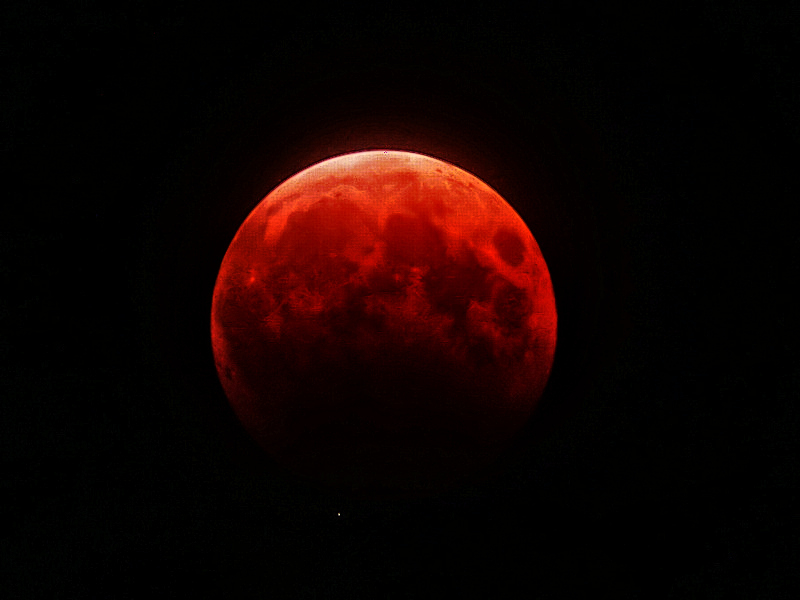 Seeing the totally eclipsed moon suspended there in the constellation of Leo, the lion, with the planet Saturn nearby will not soon be forgotten. It looked like a painting to me. I wanted to take a wide angle photograph showing the moon in Leo but the balance of the brighter moon (even during totality) and constellation would not work so I just stuck to telescopic images. My best image taken of totality is below. Wide view above with the 300mm lens. Eclipse of December 21, 2010 "The Solstice Eclipse"
For me this is the eclipse that almost wasn't. 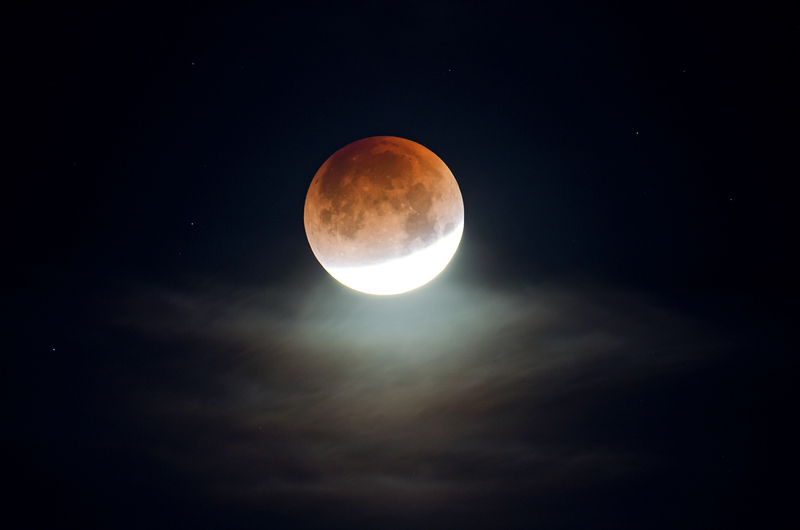 It was an eclipse that occurred during the early morning hours on a day in which the winter solstice also occurred. 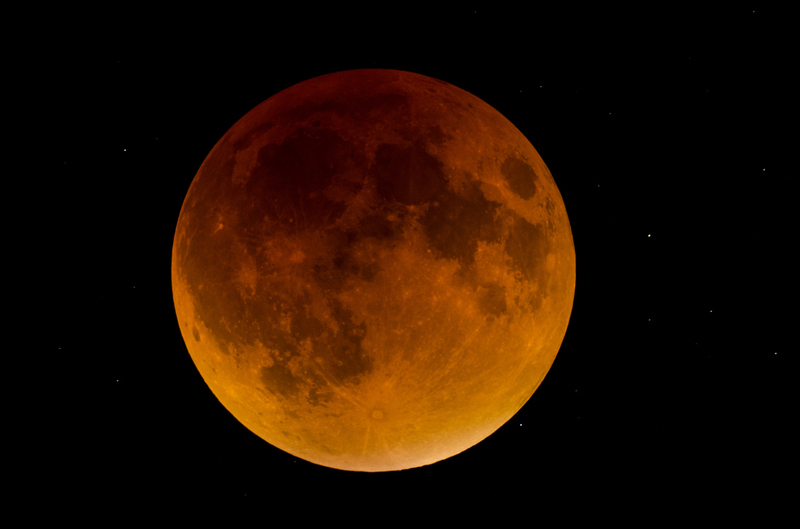 It was referred to as the "Solstice Eclipse". I went to bed the previous evening with a thick stratus deck of clouds hanging over me with all hope lost as to seeing this eclipse. By midnight the uneclipsed moon was clearly visible through a high thin layer of cirro-stratus clouds so I decided to get up and try to observe it anyway. Within a half hour of getting up the skies were clearing further and a wave of terror washed over me that I had not prepared any of my equipment for this event since I had written it off due to the previous night's clouds. 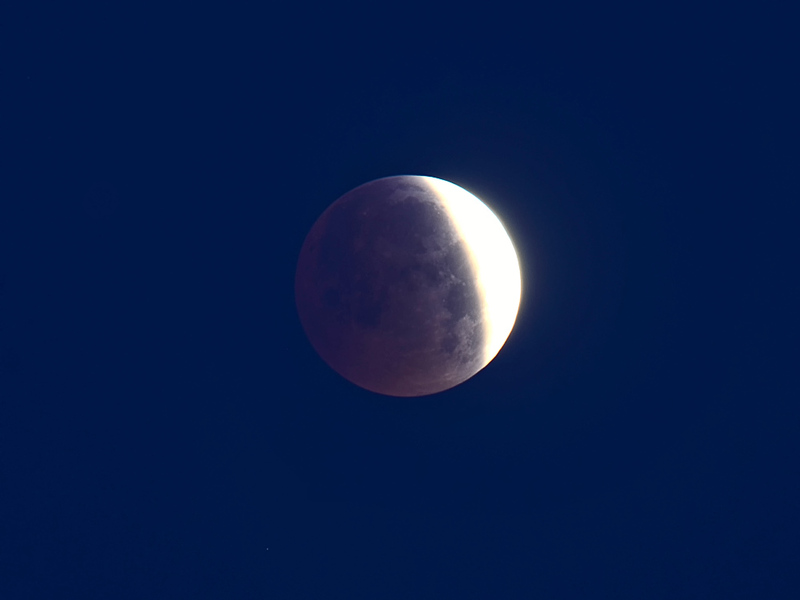 I then spent the next hour before totality hurriedly configuring my telescopes and mounts to photograph the moon in eclipse. I made it just in time albeit a little less perfect than I'm used to operating. But it worked. 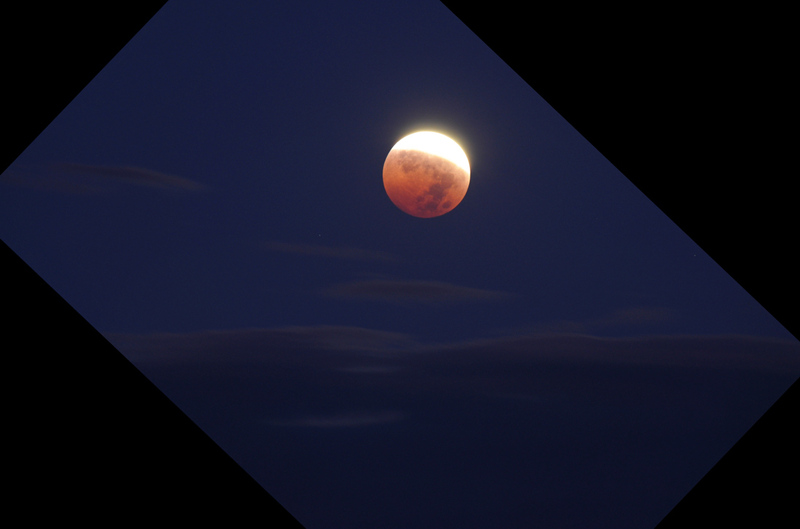 The results were my most successful images yet of a totally eclipsed moon. 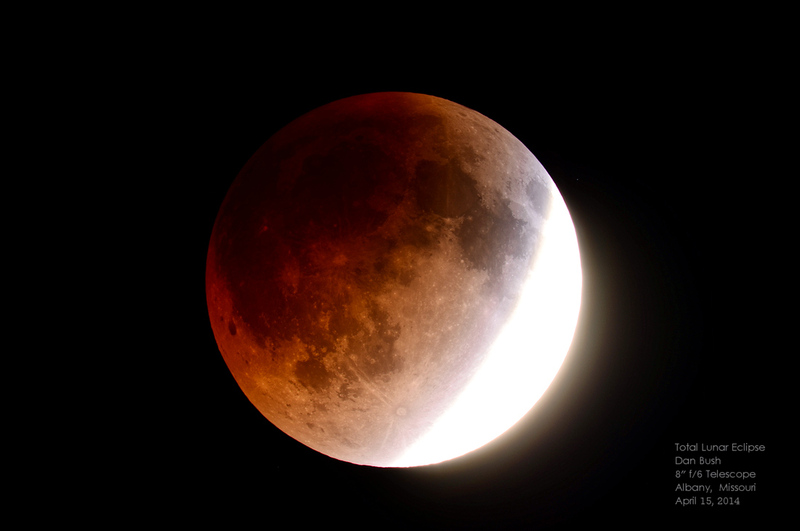 The appearance of this eclipse was very similar to that of the 2008 event. Weather conditions were much better this time with temperatures in the 30's F and little or no wind. I used the same telescope configuration as I did in 2008. Why change the equipment if it works? Something new I had at my disposal was the Nikon D90 camera which offered better resolution and better sensitivity with less image noise. The images came out the same as the D70 last time but it was easier to get better results. The eclipse was quite bright again which had a lot to do with the clarity of Earth's atmosphere. Because of it's similarity to 2008 I'd say that not much has changed in the atmosphere since then. This seemed to be a longer and deeper eclipse. The eclipse began high overhead and was easy to photograph from inside the observatory once again. This was very handy. As I watched and photographed this eclipse it dawned on me that each of the eclipses in which I've taken part are a testament to the technology that we humans have available with which to record such an event. Starting off with just a diary above I graduated from one camera technology to the next with increasingly better results in my opinion. There isn't any technology that I would refer to as inferior because each was what I needed at the time to record the event for my memory. Below is a sampling of the images that I made on this early morning. They are of different exposures and may be brighter of dimmer than actuality. 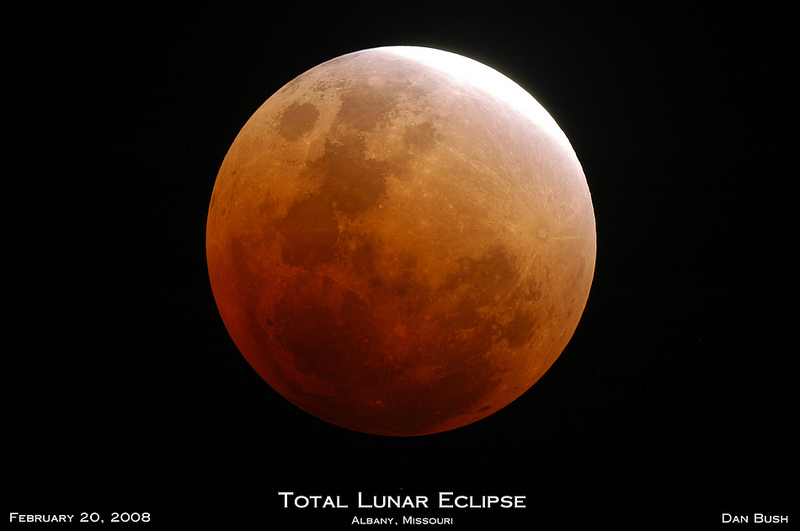 Eclipse of April 15, 2014 "#1 in a Tetrad of Four Lunar Eclipses in a Sequence"
This was a first in a series of four lunar eclipses visible in a tetrad of eclipses. 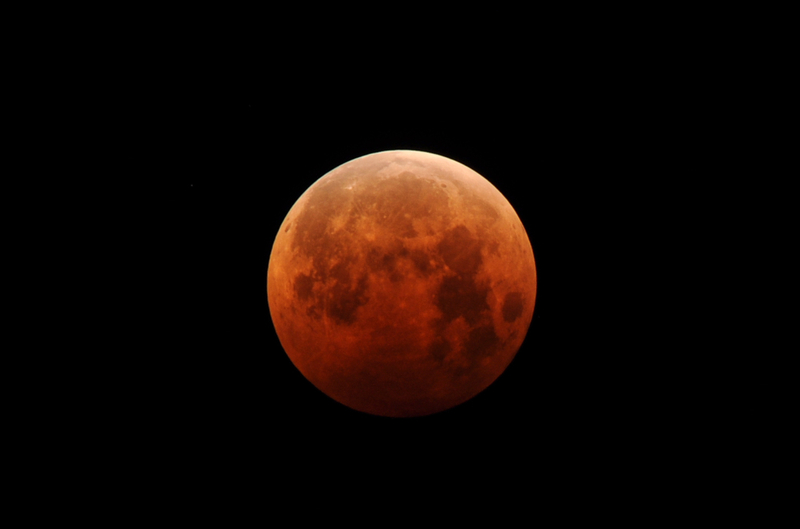 Conditions for this eclipse were great occurring on the heals of a passing cold front with rain and very cool temperatures for an April in Missouri. Partly cloudy skies early on in the evening gave way to mostly clear skies during totality. Temperatures dropped well below freezing. 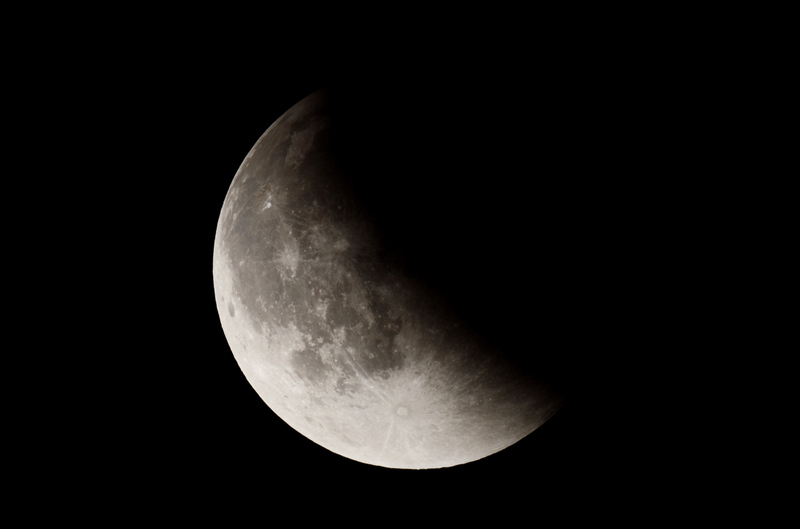 This eclipse was much darker than previously seen in recent times but not as dark as the 1982 event. 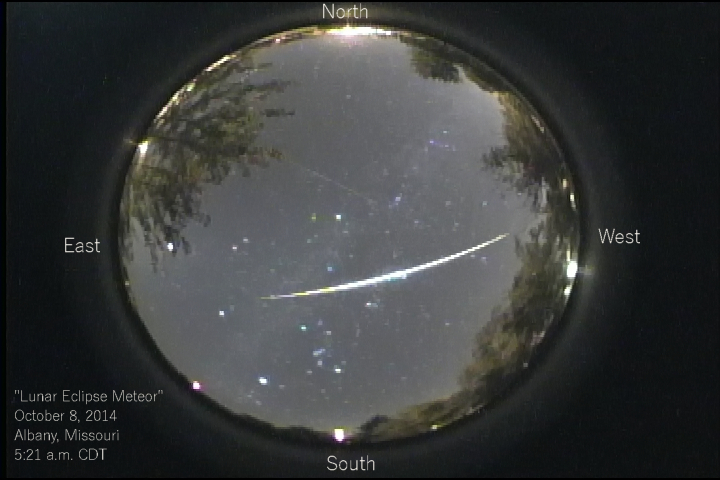 I simultaneously photographed the event with 3 cameras; two DSLR's and an all sky camera. 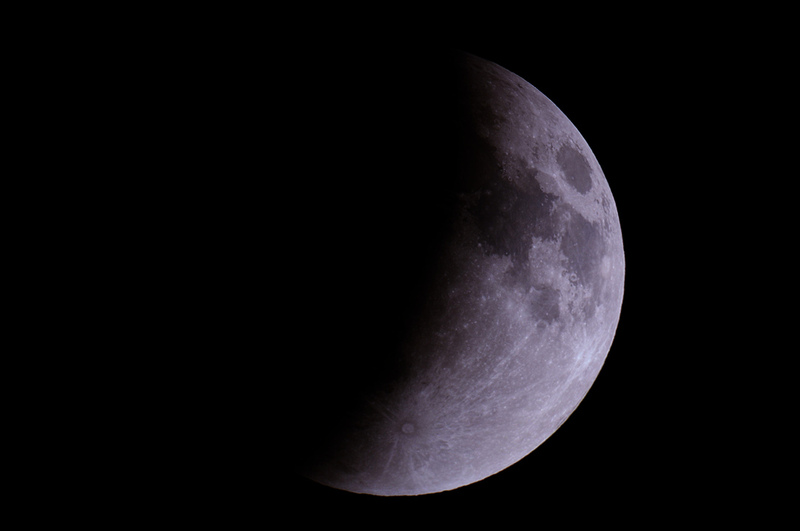 The all sky camera view was broadcast "almost live" to the web. Coyotes were howling during the darkest part of the eclipse. I have had a run of good luck with the weather and the past 3 eclipses. I don't expect this to continue and will not be disappointed if one of the next 3 gets "rained out". 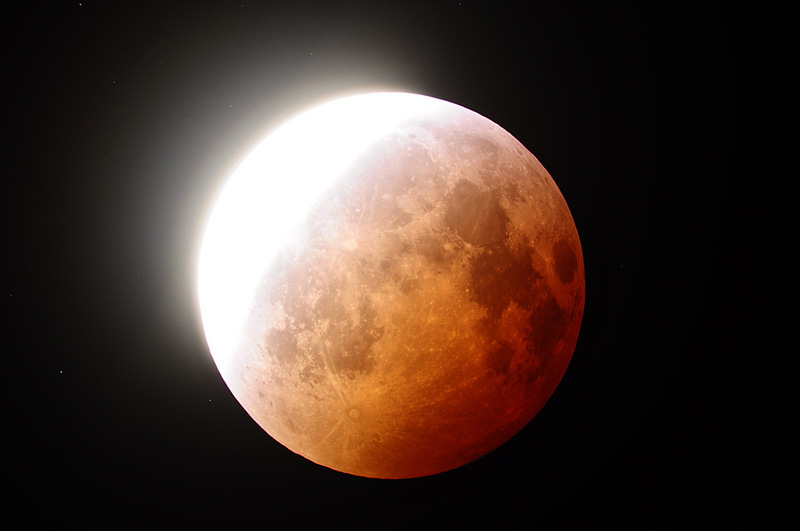 Eclipse of October 8, 2014 "#2 in a Tetrad of Four Lunar Eclipses in a Sequence"
This was the second in a series of four lunar eclipses visible in a tetrad of eclipses. Because of some interference by trees and the low altitude of the event in the western skies of Missouri I was not able to use my observatory and tracking devices to photograph this eclipse. Because of this I used property owned by my brother, John, just south of Albany, Missouri near Lee's Lake. 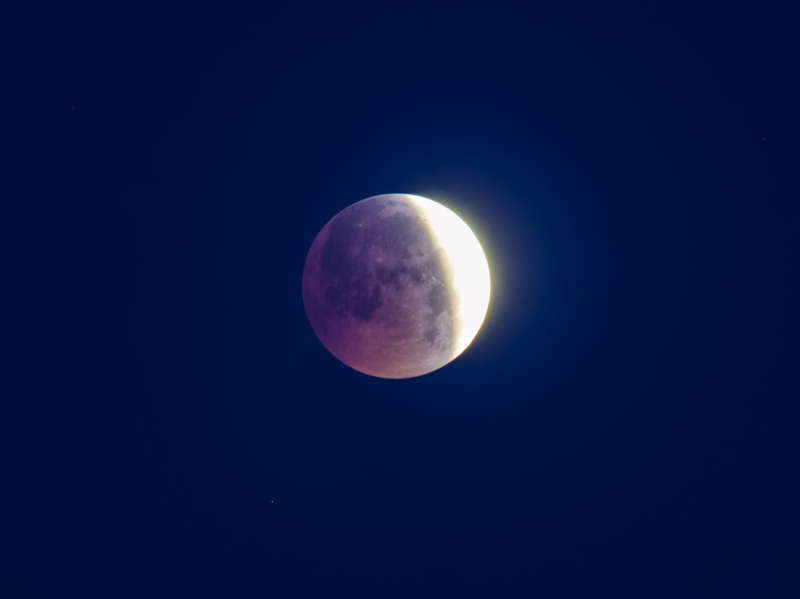 I was able to use my telephoto lenses and an AstroTrac tracking device to photograph the event and catch some interesting images including an eclipsed moon with a dark blue sky background and a plane passing in front of the eclipsed moon. To cap everything off there was an unrelated very bright and long track meteor that originated in the direction of the totally eclipsed moon and passed nearly overhead. 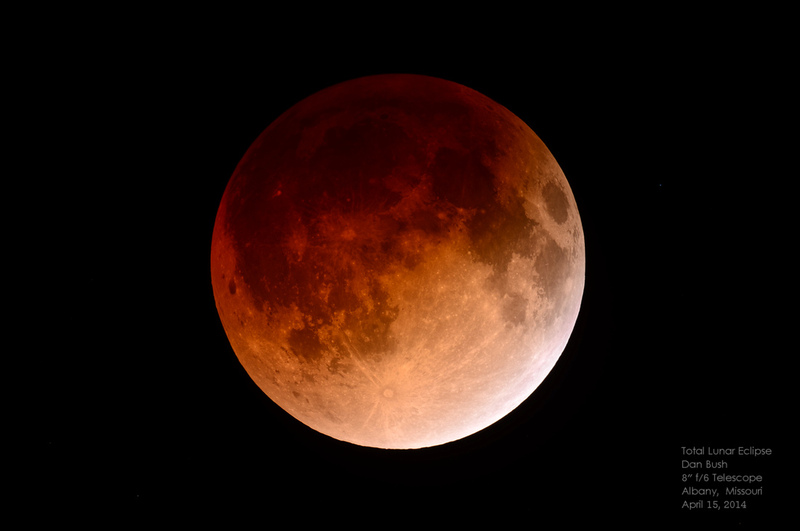 Eclipse of April 4, 2015 "#3 in a Tetrad of Four Lunar Eclipses in a Sequence"
This was the third in a series of four lunar eclipses visible in a tetrad of eclipses. 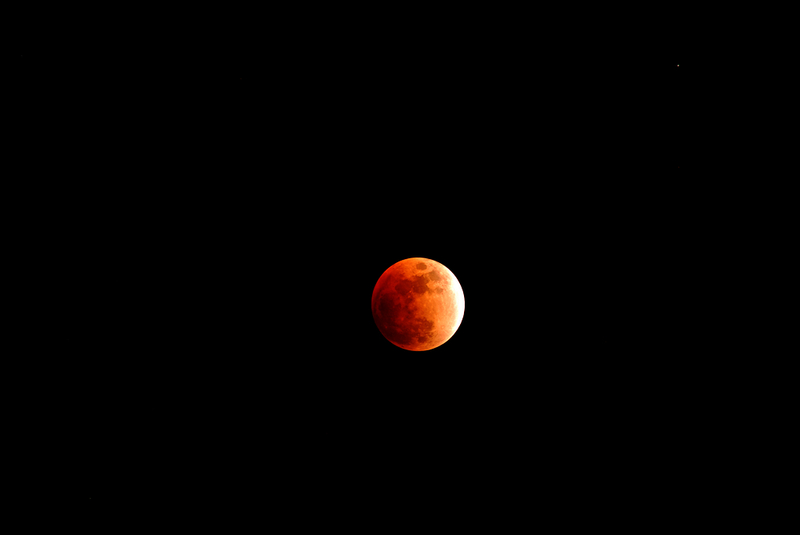 It was not very well placed in my Midwestern sky for photography and was not visible during its brief totality. I enjoyed witnessing it anyway. The early spring sound of frogs provided a backdrop for this cold but clear morning. 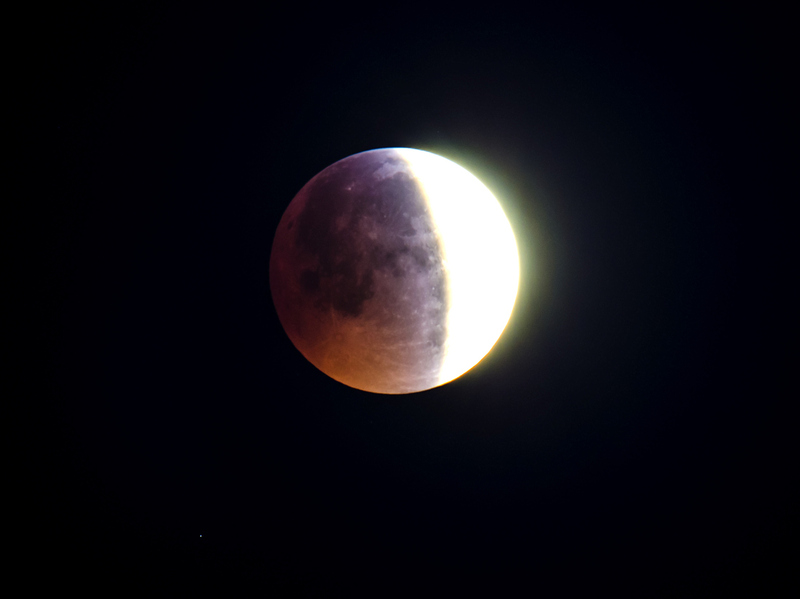 The colors in this eclipse looked like they were going to be different than in others including a blueish cast to parts of the eclipsed moon. 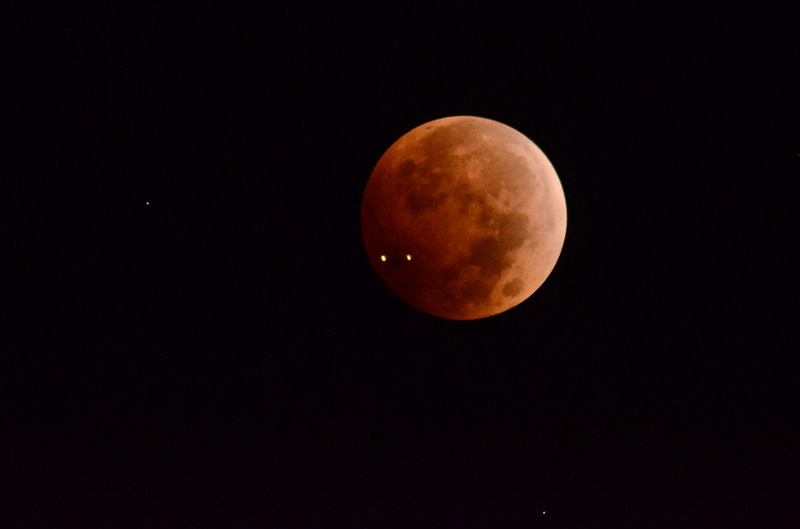 Total Eclipse of September 27, 2015 "#4 in a Tetrad of Four Lunar Eclipses in a Sequence"
This was the fourth in a series of four lunar eclipses visible in a tetrad of eclipses. 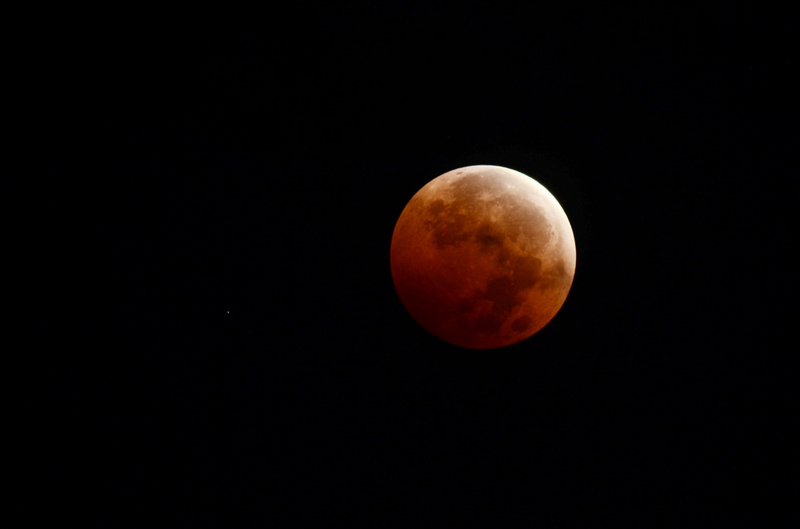 This, my 13th Total Lunar Eclipse, was hands down my favorite eclipse. I will list the reasons why this was a very special event. It occurred in September. The skies were crystal clear and the temperature was perfect. 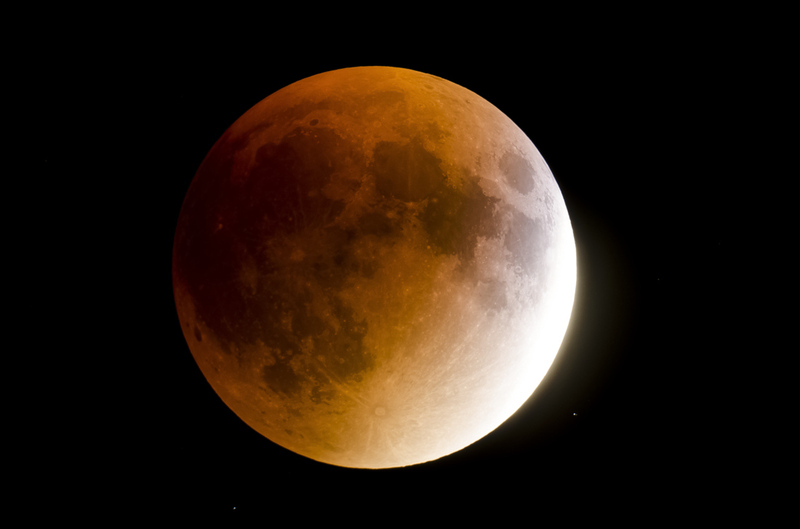 None of the nasty cold as in some of the past eclipses. It occurred in the evening sky. 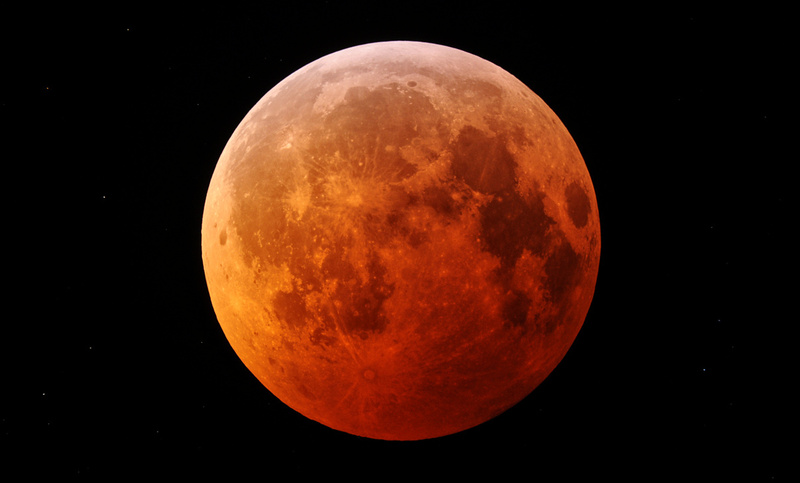 This eclipse was widely viewed as it was highly publicized as mentioned below. It was well placed in the sky. I could view the entire eclipse from the comforts of my private backyard observatory. There were no trees in the way. All the equipment that I needed to view and photograph was in place. I didn't have to go anywhere. The eclipse came to me. It occurred on the weekend and I had Monday off from work. This was not planned but really worked out well for me. This eclipse has highly publicized almost to the point to "too much". 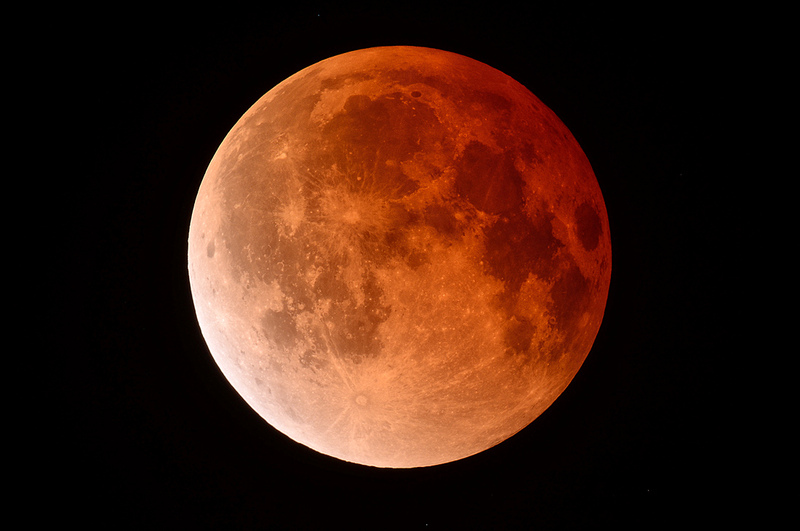 It was billed as the "Supermoon Eclipse" or the "Blood Moon". I guess this is a way to make the eclipse sound more exciting to some. 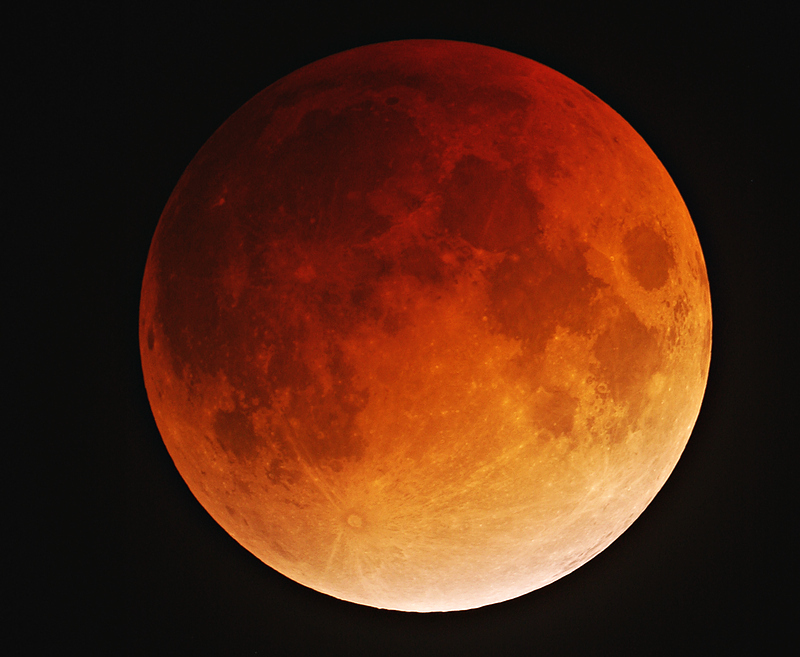 This eclipse basically looked no different than other eclipses although each one is special. 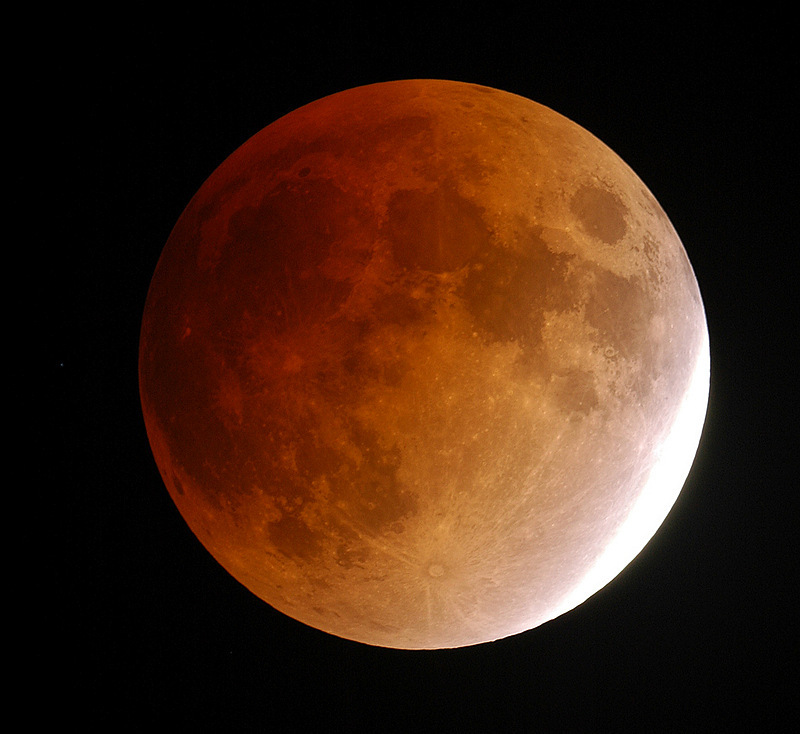 I chose to view its significance as the total eclipse of a harvest moon, a full moon very important in American lore. 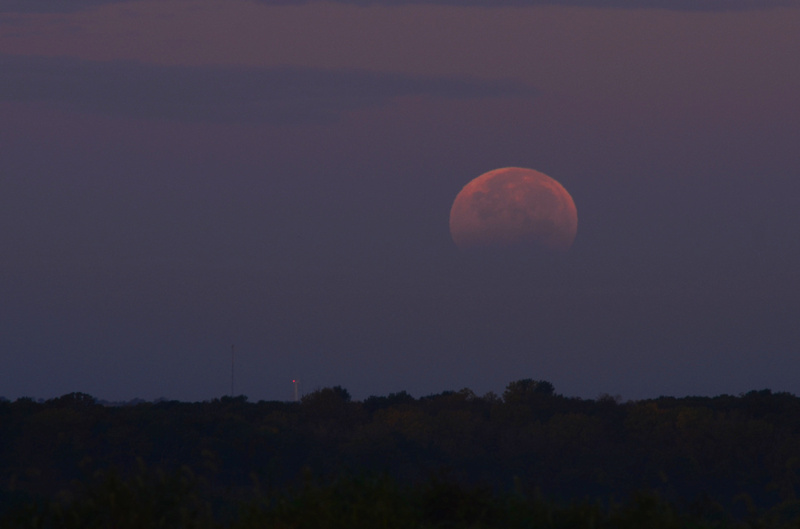 The harvest moon rising on eclipse night. 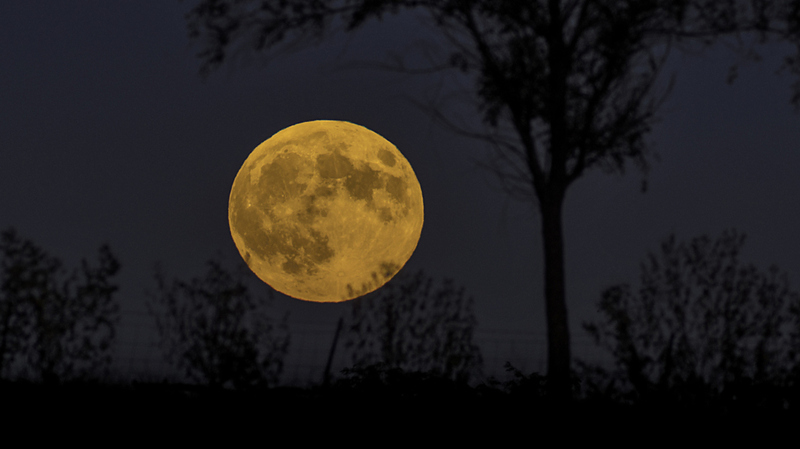 The harvest moon totally eclipsed. Partial phase egress of the eclipse. A startrail view of the eclipse from start to finish. This eclipse was difficult to observe as totality begin just a few minutes before the moon sat and the sun rose. This coupled with clouds, wind, and cold made for an unpleasant experience. 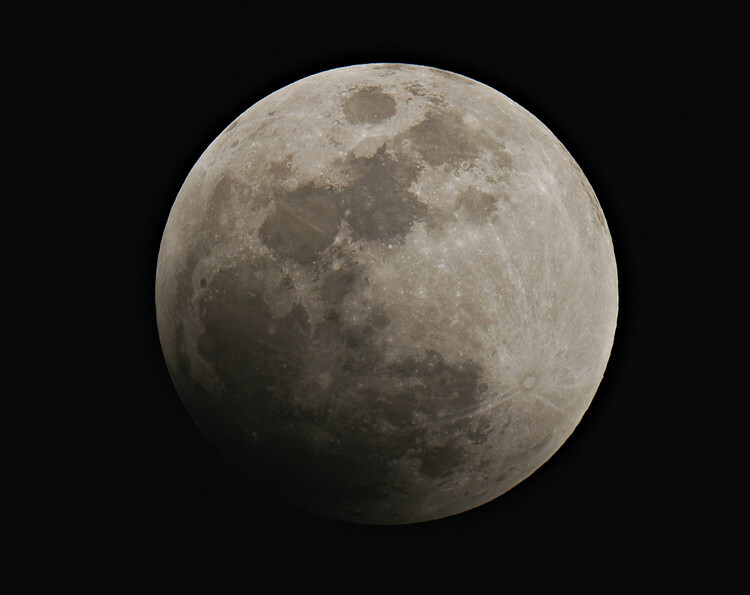 There were a few instances before totality, though, when the moon came out and presented itself for a few tracked images with the 500mm lens. 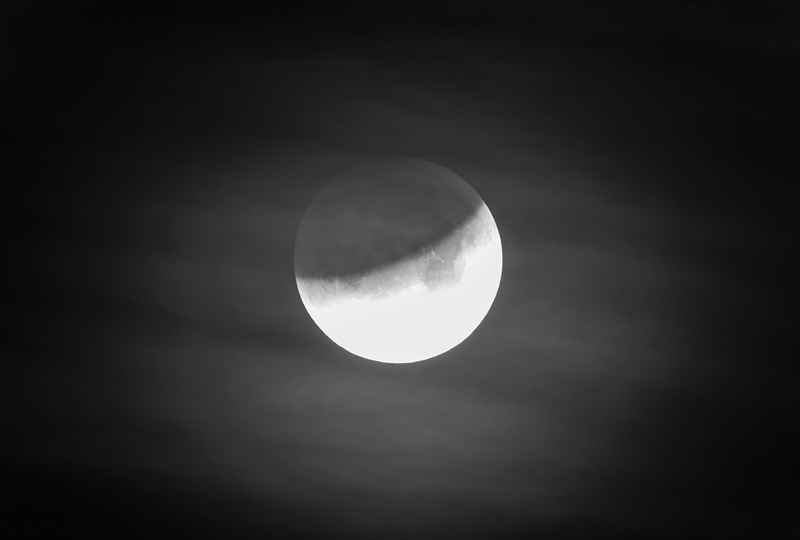 Partial phase ingress of the eclipse just before the clouds moved in. 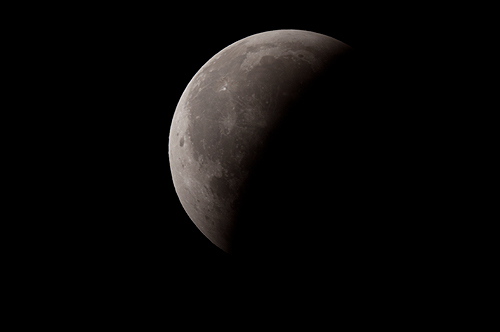 An overexposed view of the partial phase ingress of the eclipse.